Tokyo, November 11, 2016 – Fuji Heavy Industries Ltd. (FHI), the manufacturer of Subaru automobiles, is pleased to announce that it will debut its unique EyeSight driver assist technology in China. EyeSight’s launch on the Chinese market, following on from its introduction to the Japanese, Australian, North American and European markets, enables FHI to extend EyeSight’s deployment across markets globally. Cumulative sales of Subaru models equipped with EyeSight surpassed 900,000 units in the global market. The EyeSight-equipped Outback and Legacy (Chinese specs.) will be exhibited at the 2016 Guangzhou International Auto Parts & Accessories Exhibition to be held in Guangzhou, China (Press day: November 18 / Open to the public: November 19 – 27). The EyeSight is the first driver assist system ever to use only stereo cameras to detect the objects such as vehicles, pedestrians, cyclists and motorcyclists. Since its Japanese debut in April 2008, features available on this system have been highly praised; they include pre-collision braking control and all-speed range adaptive cruise control tracking function. FHI keeps offering substantially enhanced preventive safety performance to more customers by expanding the EyeSight driver assist technology to the global market. EyeSight has earned outstanding ratings for its preventive safety performance from third-party organizations. 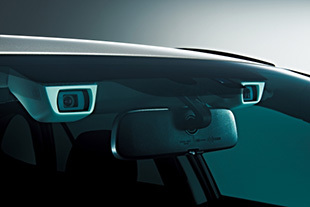 Subaru vehicles incorporating EyeSight were awarded the highest possible “superior” rating in tests assessing the performance of front crash prevention systems as part of the 2016 safety assessment conducted by the Insurance Institute for Highway Safety (IIHS; a nonprofit organization supported by auto insurers in the US). In Japan, EyeSight-equipped vehicles were awarded the highest possible JNCAP*1 ASV+*2 rating in the preventive safety performance assessment conducted by the Ministry of Land, Infrastructure, Transport and Tourism, and the National Agency for Automotive Safety & Victims’ Aid (NASVA). EyeSight-equipped Subaru has also won the highest five-star overall rating in the 2016 European New Car Assessment Programme (Euro NCAP) *3 safety performance test. FHI is committed to offering its customers Subaru’s distinctive “enjoyment and peace of mind” driving experience through the Subaru brand statement of “Confidence in Motion”. Subaru will continue to enhance its primary, active, passive, and pre-crash safety technologies under its “all-around safety” principle, which underpins enjoyment and peace of mind for all drivers and passengers.